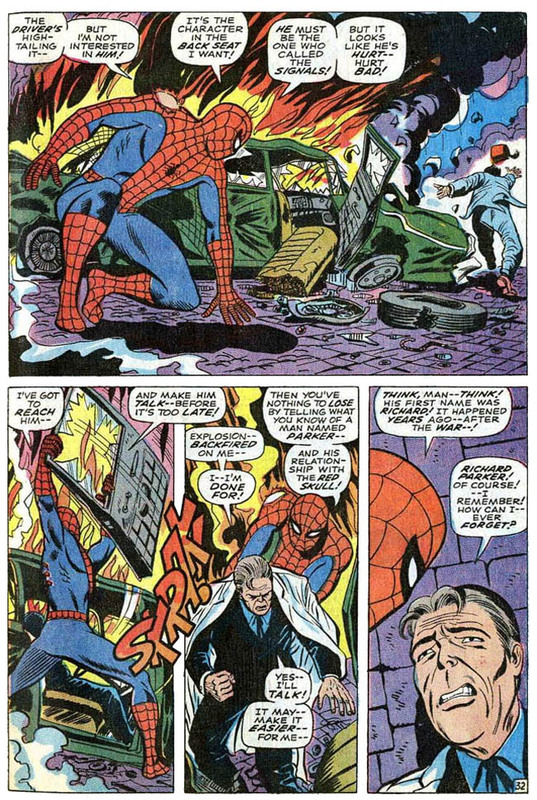 Everyone knows the story of young Peter Parker; a young nerd empowered by an uncanny accident with the proportional speed and strength of a spider, who learned a lesson about power and responsibility through a tragic loss. 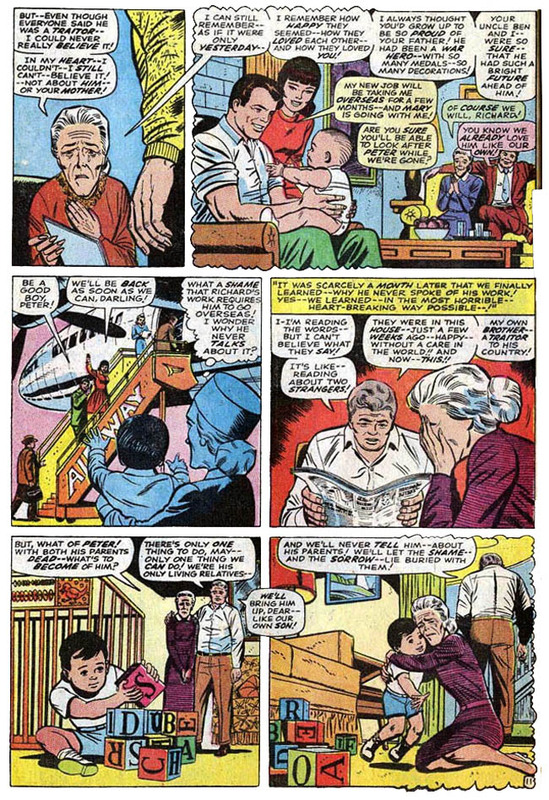 Indeed, the death of his Uncle Ben and the status of his frail Aunt May is the cornerstone of Pete’s story, even fifty years later, but one question often goes unasked: How did he get orphaned and left in his Aunt & Uncle’s care in the first place? 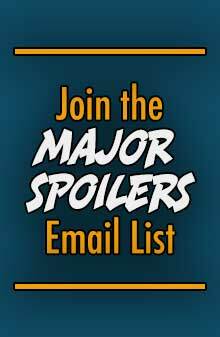 Your Major Spoilers (retro) review awaits! 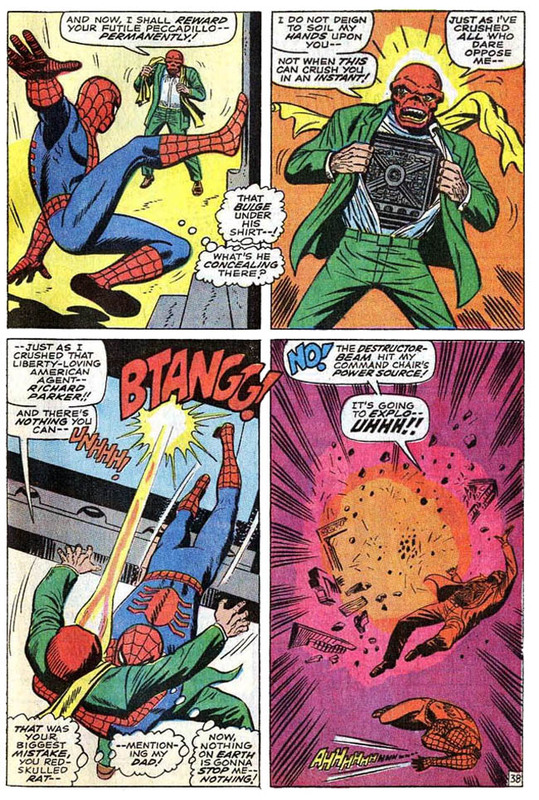 Penciler(s): Larry Lieber; John Romita, Sr. 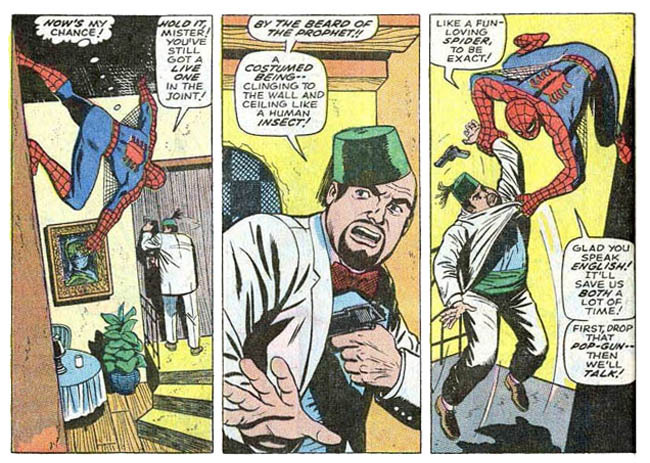 Previously, on Amazing Spider-Man: A doomed spider lowered himself into a radiation experiment, and his dying act empowered a bespectacled nerd with abilities to become something more. 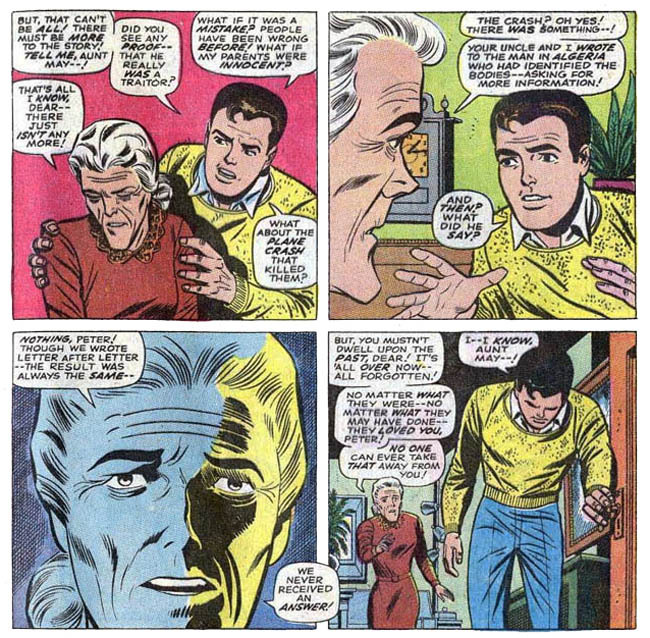 Peter Parker has cool red-and-blue tights, the gift of gab, and some technical prowess, but what he has never had is the real story of what happened to his mother and father… until now. 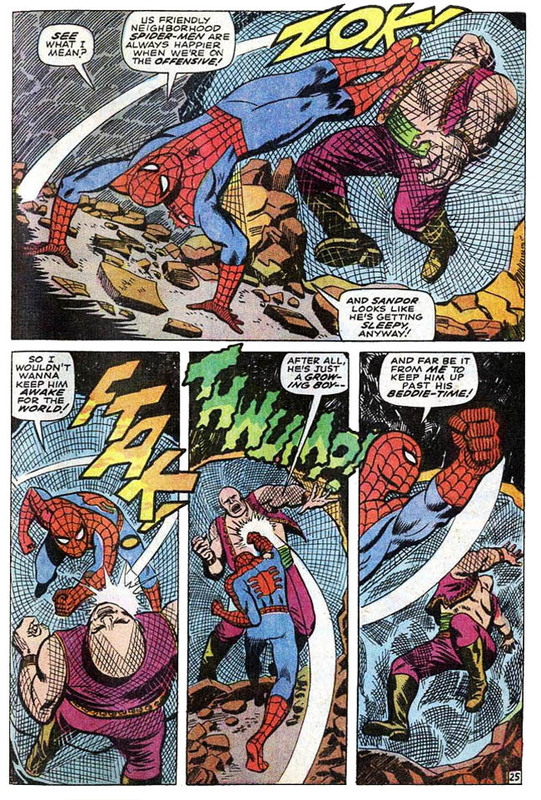 The time: Just a couple of years after that spider-bite changed Peter’s life forever. 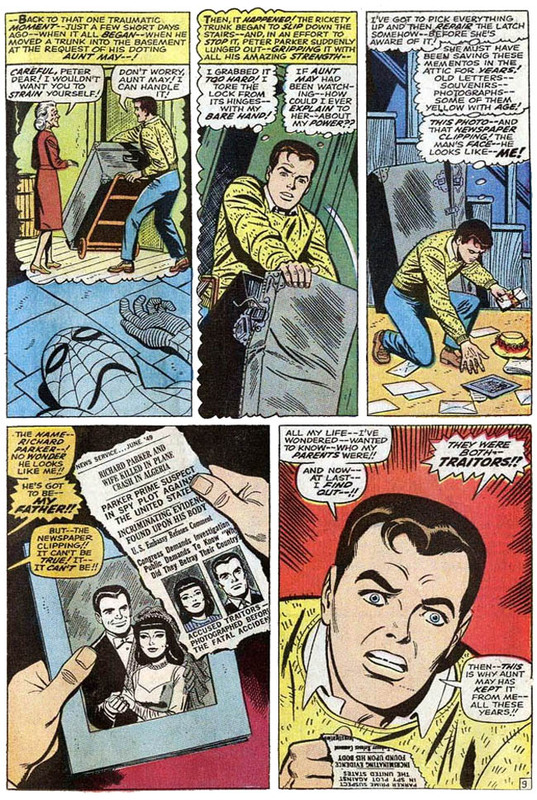 In the 616 Universe, it seems that Richard and Mary Parker were Julius and Ethel Rosenberg. 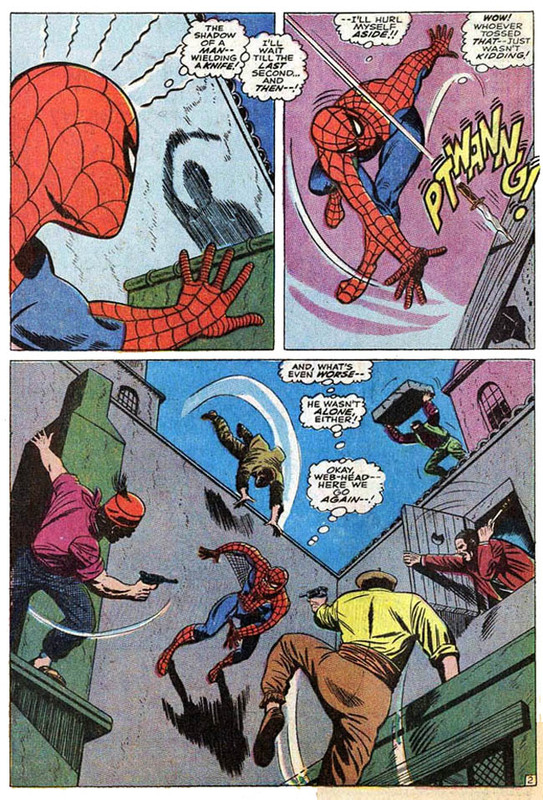 A shattered Peter races up the stairs to confront Aunt May, only to for his widower Aunt to tell him a terrible tale of betrayal and loss, with a pretty heart-breaking scene of Ben Parker reading the paper, filled with grief and disbelief at the news of his little brother’s betrayal. 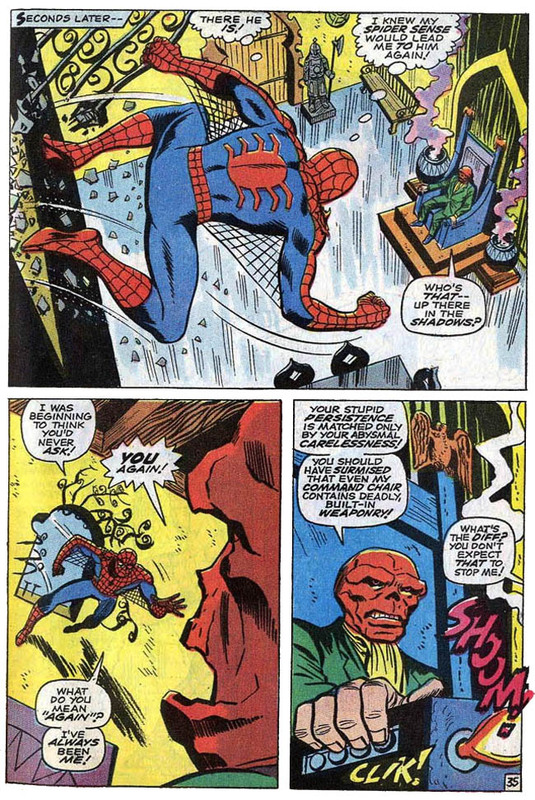 Making this sequence better is that, in my head, the goon is voiced by Tor Johnson, the Skull by Maximillian Schell and Spider-Man by Michael Bell, making for a surreal imaginary episode of Spider-Man and his Amazing Friends. 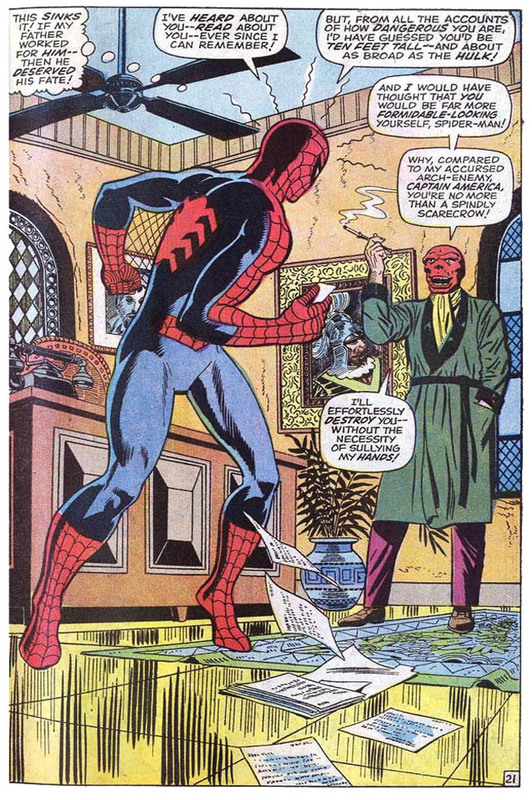 Thsi show of force leaves even the Red Skull impressed by Spidey’s raw power, and calls in the greatest assassin in Algiers, the legendary Finisher, to rid him of the spider-menace once and for all. 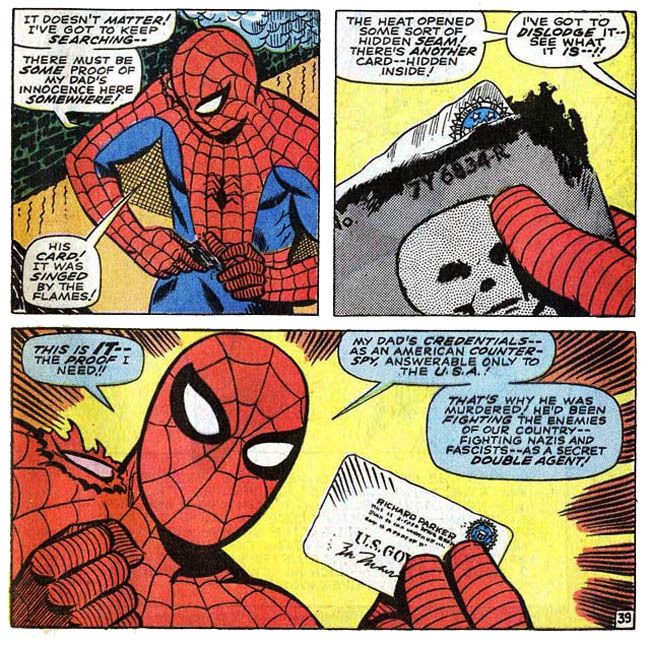 IT WAS ACTUALLY HIDING A GOOD-GUY MEMBERSHIP CARD!!!! YAAAAY! 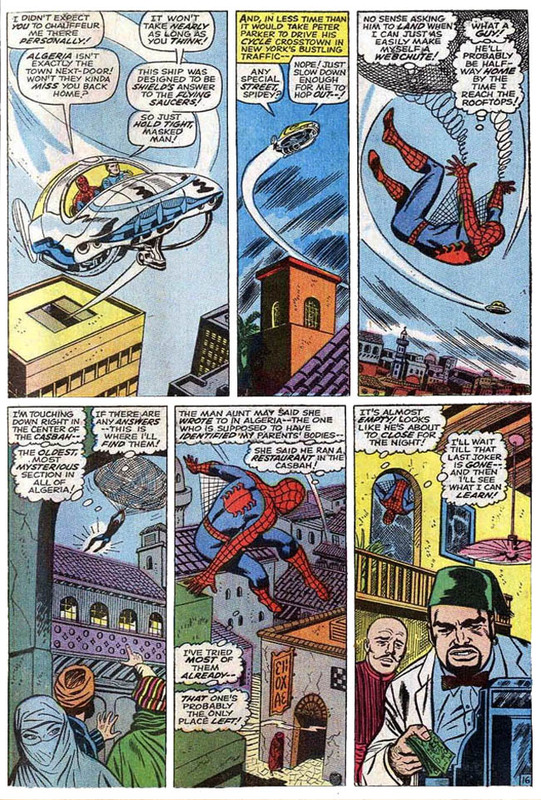 …while also making me sad, in that comic books of 1968 were designed to compete with more than just the comic books from the other companies that served the 50,000 or so customers who know where the comic shops are. 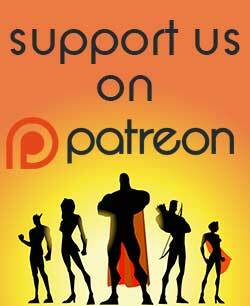 This issue’s take on Casablanca (or perhaps the Maltese Falcon?) 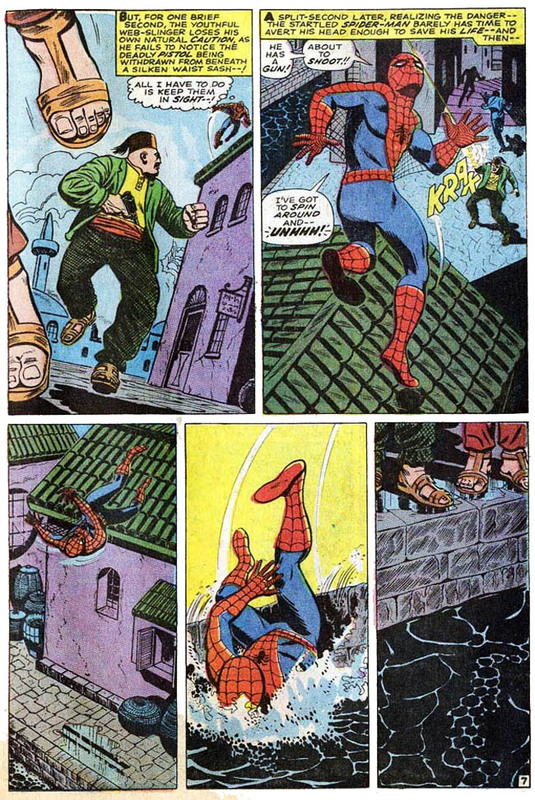 is a fun one, and at this point in time, the reveal that Peter’s parents were secret spies was a cool one. 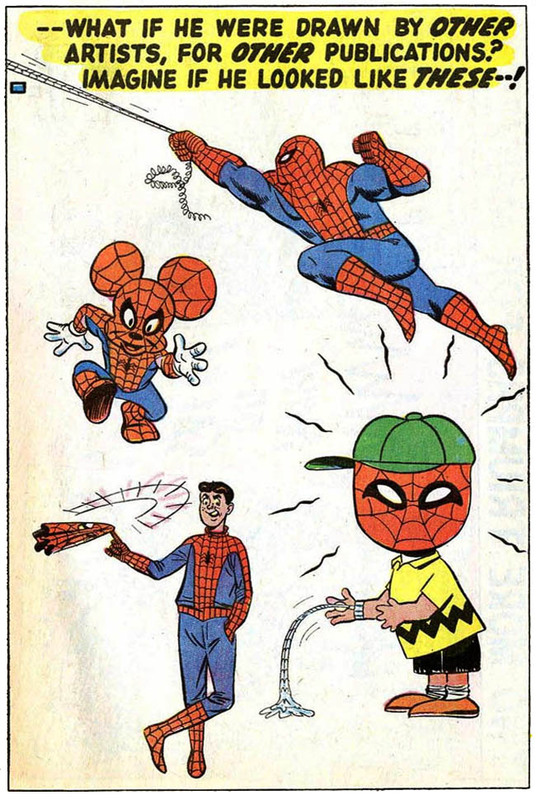 Later years would turn this retcon into “Peter’s parents were the GREATEST spies ever!” and eventually revive them before turning them into killer robots or something, but this issue works on its own merits. 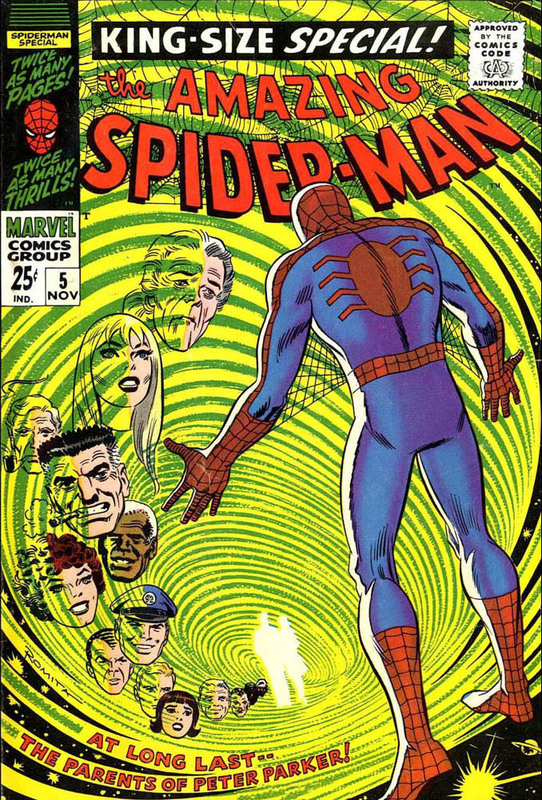 Amazing Spider-Man King-Sized Special #5 still stands as a minor Key Issue of Spidey’s early years, and even without Romita, it looks pretty good (so long as you’re looking as Spider-Man’s mask head-on), and earns a strong-but-overly-melodramatic 3.5 out of 5 stars overall. 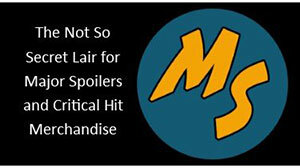 Very nice review – I totally agree with the 3.5/5 stars. 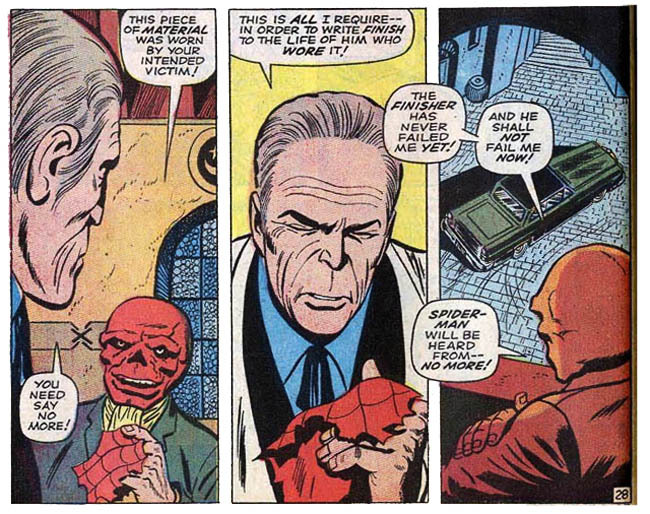 The overall story was nice especially with the appearance of the Red Skull.